The Thylacine, an odd, chimera-esque carnivore native to Tasmania, was officially declared extinct in 1986. By that time, no one had seen a live one in 40 years, so it seemed reasonable enough to conclude that a virulent, century-long concoction of wholly barbarous (yet officially sanctioned) hunting methods, disease, deforestation and competition from other predators had wiped the creature from the face of the earth. However, that may not actually be the case, as recent sightings, including one reported in January of this year, seem to attest. So convincing are such regular sightings to scientists, cryptozoologists and other interested parties, that a new expedition was launched at around the same time, with the hope of finally capturing proof of the animals long-rumoured survival. An elusive predator last seen alive in the mid 1930âs, the thylacine, colloquially known as the Tasmanian tiger, has captured the hearts, minds and imaginations of conservationists, explorers, cryptozoologists and, just possibly, a handful of lucky eyewitnesses, for three successive generations. Dog-like in both size and form, but with an oddly angular head, an enormous gape and chocolate brown stripes running across its tail and back, the thylacine was Tasmaniaâs apex predator. It was the marsupial equivalent of a wolf, or wild dog (an example of what biologists call convergent evolution) and it existed in Australia and Tasmania for around 23 million years. The last officially recognised wild Thylacine was shot and killed by a farmer named Wilf Batty in 1930. Six years later, Benjamin, the last captive specimen kept in Hobart zoo, died from a cruel combination of neglect and exposure. Derided as a pest and a sheep stealer, the extermination of these beautiful, shy and enigmatic twilight hunters was seen, at the time, as a positive step towards the taming of the Tasmanian wilderness. However, by the time the creatureâs numbers had almost completely diminished (if not actually expired entirely), it had become the first poster-child for conservation, an idea practically unheard of before the early 20th century. 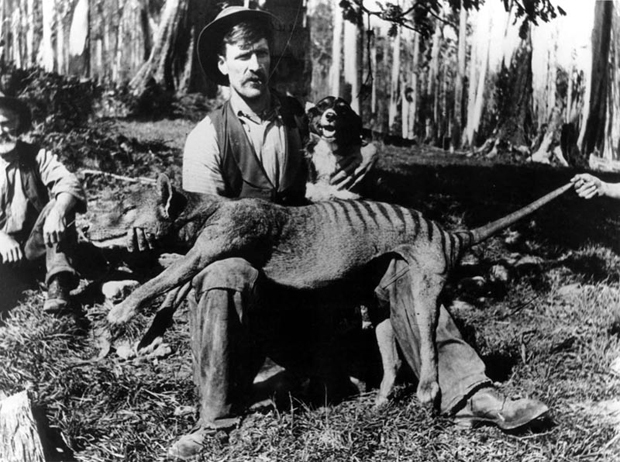 The Tasmanian tiger was even among was the first animals to be classified as an endangered species. Concordantly, there is a suggestion that a collection of individuals were shipped over to the Australian mainland and secretly released into the wild there, as an act of conservation. However, despite the aforementioned declaration of the thylacineâs extinction, evidence occasionally comes to light which suggests that rumours of the Tasmanian tigerâs death may be somewhat exaggerated. In South Australia, 1973, a very compelling piece of footage was taken on 8mm film stock. The footage appears to show a thylacine running across a rural campsite. The gait and running style are entirely unlike a dog or dingoâs and the animalâs lithe, slender form and bony, tapering tail, potentially offer us a tantalising glimpse of a creature that just may have survived extinction. In 1985, yet more photographic evidence was offered, this time by Australian Aboriginal tracker Kevin Cameron, who photographed what appears to be a thylacine digging in the ground behind a rock. In 1982, Parks and Wildlife Service researcher Hans Naarding was gifted with an opportunity to observe a thylacine up close for several minutes, even going as far as to count the stripes across its back (12, in case you wondered). A similar account, also filed by a Parks and Wildlife Service employee, emerged in 1995. Eyewitness accounts of the creature are both numerous and, for the most part, highly consistent. Although some reports are obviously mistaken accounts of dogs afflicted with mange, or even foxes, others still are surprisingly credible. The most recent sighting of this incredibly rare creature occurred in January of 2014. It was reported to the Thylacine Research Unit (T.R.U), via the organizationâs official website. The eyewitness, named as Jeremy by the site, revealed that he had seen a 40-50CM tall creature that was about the same length as a small dog (defined as 1metre), whilst out walking in the Landsborough area of Queensland, Australia, not far from the Dularcha National Park. According to Jeremy, the creature had light, sandy coloured skin and faint stripes across its back and tail. Jeremy says, âAs I watched it from the side angle, I saw its head appear and thought, oh its a wallaby, but as it emerged I saw it was on four legs, so thought it was a wild dog. But as it went away into the next thick bush, I noticed light coloured stripes at the rear near its tailâ. Once the animal had retreated into a more heavily forested area, Jeremy decided to âlet it beâ and tell his friends about what heâd witnessed. Apparently, Jeremyâs girlfriend later revealed that she had also seen the creature in the area. Emphatic that neither of them had seen a dog, or a dingo, Jeremy searched exhaustively online for any kind of striped, dog-like marsupial, but came up empty handed. There was only one logical conclusion. Proponents of the thylacineâs continued survival often argue that sightings are increasing because the animalâs population may be enjoying a recovery. It has been estimated that if a breeding population of tigers did survive the 1930âs extinction, that it would take them a reasonably long time to return to sufficient numbers. If that is indeed the case, then 70+ years ought to do nicely. Hopefully, it should now start to get easier to spot, and conclusively document, a living, breathing 21st century thylacine. Next story Where Are Sepura Radios Used? WeCan.Org.UK © 2019. All Rights Reserved.